Ry Cooder knows a thing or two about composing music for Film and about music for Westerns in particular. So when he says the theme song for High Noon is magical I listen closely. I advise you to do the same! Now isn’t that a masterclass in how to ensnare an audience and prepare them for the tension and drama ahead! As High Noon’s sweeping opening sequence proceeds we know that this will be an elemental drama played out in frontier country. The frontier – where upholding the law is no simple matter of enforcing statutes in dusty volumes but a constant battle between order and peace and bloody chaos. Our hero will need to stand tall with all his courage if civilisation is to prevail. Such immense impact with so little instrumentation. Musically everything is invitation and subdued suggestion. Lyrically in a few short verses with the title only mentioned once the entire arc of the narrative is elegantly and tantalisingly laid out for us. Tex Ritter sings like an oracle of the gods who knows the resolution of all stories. Mere men and women have to attend, wait and falteringly live them out. There is a wedding. But a wedding marred by dread that one party may be forsaken on what should be such a day of Joy. A bad man with a gun, a deadly killer, bent on revenge, has left prison. He will arrive on the Noon train. A man, a western man, has to, must, face down his enemy and his fears. Oh, oh, Love would say what does this matter today of all days? But though the call of Love is loud the call of Duty is louder. Death is nothing but life as a craven coward always looking over your shoulder? Though you may lose your fair haired beauty you can’t, won’t, leave before that train arrives. No man wants to die a coward. No man wants to live forsaken. The big Hand moves along. Look at that big hand move along. Settle down in your cinema seat, exchange smiles with your companion, this High Noon is sure to be one hell of a ride! Dimitri Tiomkin who was born 1894 in Kremenchuk Russia – far, far, away from The American Frontier. He had training with distinguished teachers in St Petersburg, Berlin and Paris and before he badly broke his arm he harboured dreams of stardom as a concert pianist. After moving to America in 1925 he followed the golden trail West to Hollywood hoping to make a career as a Film Composer. HIs big break came through writing and performing the score for Frank Capra’s ‘Lost Horizon’ in 1937. He would go on to work on a series of Films with Capra including ‘It’s A Wonderful Life’. He had already produced two wonderful Western scores for ‘Duel in the Sun’ in 1946 and ‘Red River’ in 1949 before the commission came for High Noon. Tiomkin had a genius for embedding stirring, highly memorable, folk like melodies into his scores and for weaving them as charged motifs throughout the course of a film. Melodies that aroused the emotions and subtly augmented the voices of the actors and the drama playing out on the screen. As for composing music for Westerns when he had to evoke the majesty of the landscape and the iconic role of the Cowboy Tiomkin only had to recollect the endless steppe of Ukraine and the folkloric Cossack of Russian myth to find the melodies pouring out. Now I’ll wager there’s more than a few of you who’ll be exclaiming Ned Who? Yet, Ned has written a glorious gallery of Songs that pretty near everybody has heard and loved. How about, ‘My Foolish Heart’, ‘Stella by Starlight’ and, ‘The Nearness of You’ for Golden Age classics. And, as for Film Songs few can match him – ‘When You Wish upon a Star’ and, ‘Baby Mine’ for Disney. Any good at Western Ballads? Not bad at all if, ‘Gunfight at the O.K. Corral’, ‘3.10 to Yuma’ and the theme for ‘Rawhide’ are anything to go by! Combining their immense talents and understanding of the role of music and song in Film Tiomkin and Washington composed a Song which is endlessly alluring. Like a great Western it feels familiar and mysterious simultaneously. It feels like a song, a melody and a a lyric, that has emerged into the daylight from the hazy depths of your dreams. You can’t help singing along in whatever register of voice you have (I like to affect a basso profundo in my own version). Amazingly, in view of its eventual immense success, initial previews of High Noon did not have those audiences cheering. United Artists got cold feet and held off releasing the Movie. Dimitri Tiomkin was certain however that the theme song was something special. So while United Artists hesitated he bought the rights to the Song and arranged for it to be recorded by Frankie Laine who gave it his full throated turbo drama best – and the rest as they say is history! There have been countless versions of tne song since (four other versions came at tne time of the Film’s release). At the 1953 Oscars High Noon won for Best Song and Tiomkin won for Best Music. Tex Ritter performed the Song at the Ceremony. There’s a CD from Bear Family (who else!) with 27 versions of the song – I fully intend to hear them all. Now, The Immortal Jukebox isn’t a Film Blog but while I don’t propose to go all Pauline Kael on you I couldn’t close without tipping my hat to some of those involved in the Film whose work has brought me immense delight. Gary Cooper managed to carry off the trick of being both diffident and heroic and a regular guy who just happened to be fabulously handsome. I’ve lost count of the times I’ve seen, ‘Wings’, ‘The Virginian’, ‘A Farewell to Arms’, ‘The Lives of a Bengal Lancer’, ‘Mr Deeds Goes to Town’, ‘Beau Geste’, ‘Sergeant York’, ‘The Pride of the Yankees’ and, ‘Ball of Fire’. Of course he won the Best Actor Oscar for High Noon. When they say they don’t make Film Stars like they used to it is always Coop I think of first. Grace Kelly was only 21 in High Noon. Her glowing youth made a marked and poignant contrast to Coop’s leathered maturity. She really was ‘breathtakingly beautiful’ and her career as a whole demonstrated she was a fine actress who could be archly comic as well as the thriller heroine who would make any film hero (and every regular Joe in the cinema aisles) blithely risk life and limb to win her. Fred Zinnemann was a consummate professional who understood every aspect of Film Making. His work is distinguished by an intense humanity and acute insight into the revelation of character under pressure. He was able to coax extraordinary performances from Actors as demonstrated by Montgomery Clift in, ‘The Search’, Robert Ryan and Janet Leigh in, ‘Act of Violence’ and Marlon Brando in, ‘The Men’. Beyond, ‘High Noon’ I often reach for, ‘From Here to Eternity’, ‘The Nun’s Story’ (with Audrey Hepburn even more luminous than ever), ‘The Sundowners’ and, ‘Day of the Jackal’ when I want meaty entertainment. 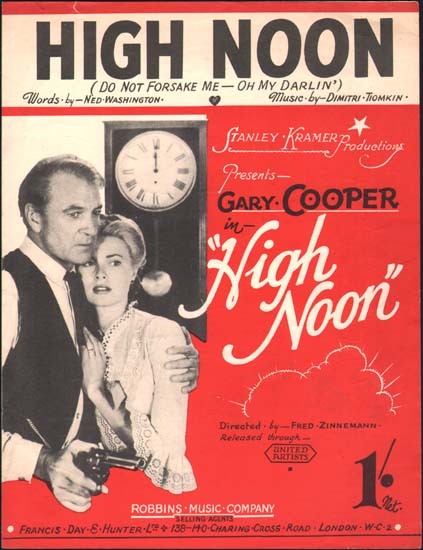 The’ High Noon’ theme of the man alone – abandoned by all who might be expected to come to his aid – is often taken to be an allegory for America in the grip of McCarthyism. I am more inclined to think Zinnemann (if not screenwriter Carl Foreman) was thinking of the situation of his parents who perished in The Holocaust. Regular readers will Know from the Post on ‘Jack Gets Up’ by Leo Kottke that Jack Elam is high in my pantheon of Jacks. He doesn’t actually get a screen credit in High Noon but all of us who cherish Western Character Actors will have no trouble in spotting his distinctive visage. The magnificent Katy was a Star in Mexican Cinema before Budd Boetticher cast her in, ‘The Bullfighter and the Lady’ . That role won her the part of Helen Ramirez in High Noon. As Helen she displays smouldering sexuality, intelligence and stoic dignity. In High Noon Lee doesn’t speak a word but Boy Howdy doesn’t he make his presence felt! The Camera just loves some faces and it fell in love straight off the bat with Lee who became the ‘go to’ villain for decades thereafter. You didn’t expect not to lionise the man who made ‘The Purple People Eater’ as well as appearing in ‘High Noon’, ‘The Outlaw Josey Wales’ and, ‘Rawhide’ now did you! 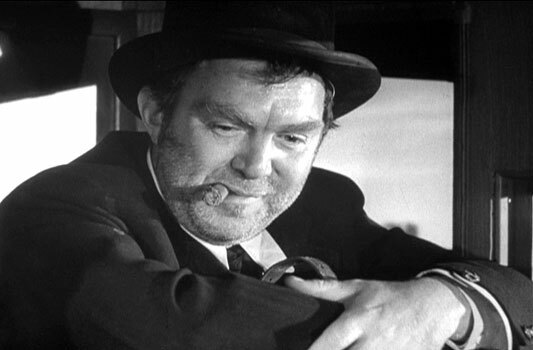 Very near to the top of my Pantheon of Toms is the great Character Actor Thomas Mitchell. His role as Doc in john Ford’s epic , ‘Stagecoach’ alone makes him one of Hollywood’s Immortals. And, of course, he had important roles in, ‘Lost Horizon’, ‘The Hunchback of Notre Dame’, ‘Mr Smith Goes to Washington’ and, ‘Gone with the Wind’ in addition to his part in High Noon. Thomas Mitchell made very part he ever took an important part. Still adrenaline surfing after my celebrations of St Patrick’s Day, Ireland’s Grand Slam triumph in 6 Nations Rugby and some long price winners at Cheltenham Horse Racing I’m signing off with a gift to you all of a joyous celebration of Western themes from Arthur Fiedler and The Boston Pops.